Warts and verruca are viral growths that deform the skin and can be found on the hands and feet. They can often be painful to walk on. They are caused by a virus called the human papilloma virus. The virus causes a proliferation of small blood vessels and nerves to feed the wart or verruca and cause pain. Warts can occur anywhere on the body but occur most commonly on hands and feet. They range in size from 1 mm to over 1 cm. The shape and size of warts vary, and they are sometimes classed by how they appear. For example: plane (flat) warts, filiform (finger-like) warts, mosaic warts, etc. Some people just have a single verrucae but we have treated patients who have had 20-30 verrucae on their feet and hands. Verrucas are warts that occur on the soles of the feet. They are the same as warts on any other part of the body. However, they may look flatter, and be pushed into the foot causing pain when standing and walking. If there is a new area of hard skin on the bottom of your foot that you have not noticed before, one possible cause could be a verruca. It is not always straight forward and easy to identify a verruca, as they do not all appear alike. In order to diagnose your problem correctly it is best to have it examined by a podiatrist. Verrucae can easily be mistaken or confused with corns. 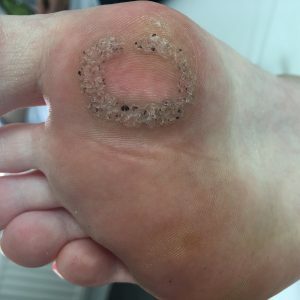 What is the most effective way of treating warts and verrucae? Fitter Feet recommend freezing Verrucae or Warts that have been present for up to 6 months. Freezing is medically called cryotherapy. It can be done under a small injection of local anaesthetic to stop the treatment being painful. The cryotherapy unit freezes the skin containing the Verrucae virus. The causes the death of the skin and the virus. You will be supplied with a dressing to make walking more comfortable after the treatment until the area recovers. Expect it to be painful or uncomfortable for between 5-15 days. The amount of pain experienced depends on the size and place of the verrucae. You are able to attend for dressings until comfortable and fully healed without additional charges. Most verrucae can be treated with one application but long standing and large verrucae may require additional treatments. Following cryosurgery the treated area can be tender, throbbing and painful for 7-10 days. This is a normal reaction. The podiatrist will provide you with the appropriate pain relief medication. If you have any concerns following the treatment please contact the clinic to speak to the podiatrist. About 10% of cryosurgery treatments cause a very large blister, which can be filled with clear fluid or blood. Do not be alarmed, this is normal. However, it is best to ring Fitter Feet and book an appointment to have the area drained of fluid. You will also be given dressings and advice on how to look after the area. There is no additional free for this care. If you are worried that you have an infection, please ring to book an appointment when we can reassure you, or issue you antibiotics if necessary. There is no additional fee for this care. Appointments are available every day apart from Sundays and Bank holidays. Cold Laser stimulates the IGG antibodies that are the body's natural defence against Verrucae. You will require 6 sessions in 2-3 weeks and then will be reviewed 8 weeks later. This gentle treatment is not painful and is recommended for children. You a can buy over the counter chemical treatments form your local chemist. We suggest you try this first, if they don't work, Fitter feet use stronger chemicals that are applied in specialised dressings under the supervision of a Podiatrist. Some Verrucae are very large or have been present many years. Often other treatments have been tried and failed. Fitter feet recommend the use of the NAG Medical laser for this type of Verrucae. It treatment is performed under local anaesthetic and destroys the verrucae and stimulates the immune system. It can be painful for up to 5-15 days depending on the size and location of the verrucae. This method of treatment is very successful if you have had the verrucae many years. Our record to date is a patient who had her verrucae 21 years covering several square centimetres of both feet, they were very sore to walk on. She had 3 separate treatments and her verrucae fully disappeared in 4 months. 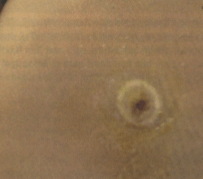 Long pulsed ND Yag Lasers rapidly heat the verrucae or warts and their blood supply to very high temperatures. How do I know what treatment to choose and how much does it cost? Please book a free appointment to assess your verrucae. Just phone us on 0207 6727 4901 and schedule a time that is suitable for you. We are open Monday to Saturday. Alternatively, you can use the contact form, but we recommend phoning for a more personal service. Your Podiatrist will advise the best type of treatment based on the size and quantity of your verrucae or warts, and the length of time they have been present. You will be given an information leaflet and the cost of treatment. You do have to sign a consent form for some treatments. If your foot is painful and swollen at the end of the day, use an ice pack around your foot or ankle for 20 minutes. Continuing this until you are fully recovered tends to speed up the healing process. The leaflet below provides information on the treatment of verrucae using cryosurgery. You may also download our verrucae and corn information sheet.